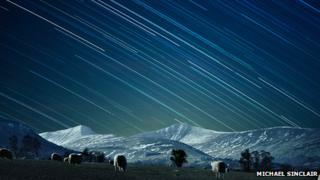 The night sky above the Brecon Beacons National Park could be awarded special protection. The park authority is applying to become an international dark sky reserve, which it hopes will boost tourism. The status means the night-sky is protected and lighting controls are in place to prevent light pollution. The national park said it already possessed some of the UK's darkest skies, which was ideal for stargazing. Officials claimed that on a clear night above the Beacons people could see the Milky Way, as well as numerous constellations, bright nebulas and even meteor showers. A lighting survey started on Sunday and a leaflet is being distributed informing people how they can help or get involved in the project. The leaflet lets residents know what they can do in their homes to help protect the night sky from light pollution. Jim Wilson, chairman of Brecon Beacons Park Society, which is part of the project, said: "We want to let people know about this fantastic opportunity so that we can get as much local support as possible to help us achieve this status. "The lighting assessors will not visit people's properties without asking for permission first. "And this doesn't mean we will be asking anyone to remove their lights - rather to ask that we're more mindful of the way we all use light, which will reduce their energy bills too." Mr Wilson said putting motion detectors on security lights or on timers, or tilting them downwards instead of skywards, would make a difference. Exmoor National Park and the channel island of Sark were awarded International Dark-Sky Reserve status by the International Dark-Sky Association last year. Bardsey Island off the Llyn Peninsula has also applied for the status. Margaret Underwood, biodiversity champion for the Brecon Beacons National Park Authority, said light pollution had an impact on wildlife. "For much of our wildlife the disruption caused by street and security lights has had quite an impact on their life cycles," she said. "Glow worms, once a magical and common site, are now rarely seen. "The dark skies project is a chance for people and wildlife alike to enjoy some of the benefits of reducing light pollution." Two years ago people in the tourist industry took part in astronomy workshops in a bid to attract astronomers to the area.